Francesca always felt a little lost. She knew she had immense power. Her mother and father spoke of it often and with fear. But she didn’t know where it came from. What did it mean? Her parents wouldn’t discuss it. All she knew was that her father had been a ruler once of a small but powerful group. He was no king but men, women and children would fall at his feet. Something had driven them from their home land. Now they were reduced to travelling from place to place, seeking scraps wherever they could find them. Francesca was growing. She was no longer a child and they couldn’t hold her forever. Julien – her twin brother – felt it too. The twins had been left alone of an afternoon. Their father – Basillio – had gone hunting. Their mother – Leona – was attending a market in the nearest kingdom of Ravensedge. Francesca pulled open a bag of books. “We’re not supposed to touch them,” Julien warned. He stretched his tall frame across the grass beside the camp they had made at an old shack in the woods. Julien continued looking up at the sky. “If they wanted us to forget where we came from do you really believe they would be stupid enough to bring books about it?” he scoffed. Francesca opened the oldest looking of the texts. She brushed her long, black hair behind her shoulders and settled her eyes on a passage. Julien sat up. She threw the book to him and he read the same passage. Vorelia is an ancient land of black magic and blood sacrifice. It is over ruled by one supreme witch. Evil is the way of their people. Those who are not of the blood are warned to stay away. “You really think that is us?” Julien was still not convinced. Francesca stood over him. She took the book back. “They have their reasons,” Julien surmised. He lay back down again. Francesca gave him a soft kick in his side. Julien sighed. He rolled his piercing blue eyes. Francseca kicked him again. This time it was a little more forceful. “They have their reasons,” Julien repeated. Julien climbed to his feet. He had the same skin as his sister, so pale it was almost blue. “What will you do?” he asked tentatively. He didn’t like the fire behind his sister’s eyes. He had seen it before and it could burn out of control. Francesca offered a wry smile. Later that day Leona returned with some bread. She noticed a sombreness had come over her children. She laid the bread down and looked to Julien – the more amicable of the twins. “Have you both had a good day?” she asked. It was Francesca who replied. Julien continued prodding the fire underneath the large pot of water that was beginning to boil. “I’ve been doing a bit of reading,” she said. Julien looked up but he still said nothing. Mother’s chest began to rise and fall heavier but her voice remained steady. Francesca folded her arms across her chest and stood before her mother. Leona gasped.”You can never go there!” she cried. Francesca gave a husky laugh. She reached her hand out and mother felt a choking pressure around her throat. She tried to pull away but Francesca was too strong. Mother was pulled along the grass and her head dunked in the boiling water. The pain was excruciating but her screams were drowned. Julien put his hand on Francesca’s shoulder but he didn’t stop her. He couldn’t even if he wanted to. Mother’s whole body was pushed into the pot. She spent her last remaining moments of life boiling. Her shrieks echoed but she couldn’t climb away. Francesca’s power held her. When she finally died Francesca stumbled back, weak. Boiling mother had taken every ounce of strength she had. The sight of mother’s leg hanging over the pot made her smile. It rejuvenated her somehow. “What do we do now?” Julian asked. “When father returns we are going home,” she declared. Subscribe to the page for more news, images and stories from Vivika Widow. Want more magic and mayhem? 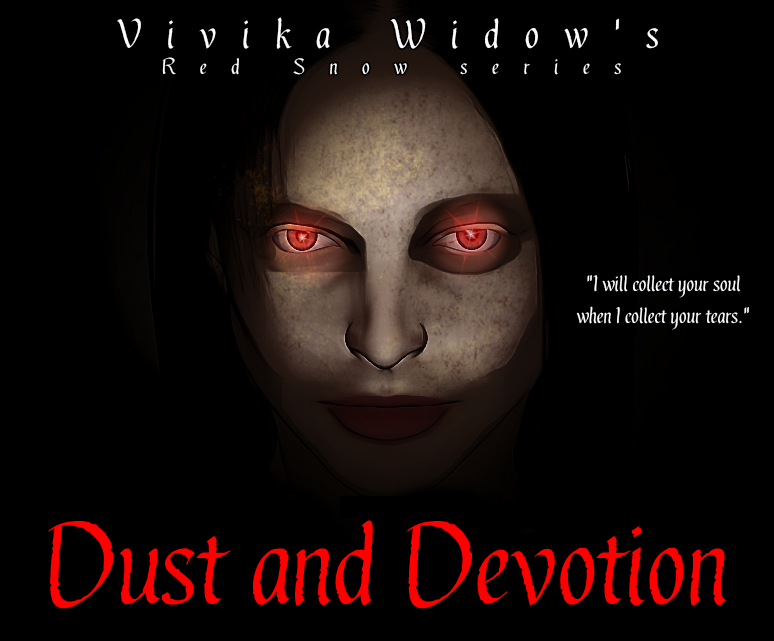 Click HERE to read Vivika Widow’s explosive introduction to the fairy tale world of Red Snow.